Ballymena United's Gary McCutcheon with Portadown's Mark McAllister during Saturday evening's Irish Cup Semi Final at the Oval. Picture: Press Eye. Ballymena United’s dreams of Irish Cup glory were unceremoniously ended in Saturday’s semi-final at the Oval. The Sky Blues’ hopes of a second successive appearance in the end-of-season showpiece were torn apart in a catastrophic opening half hour in which they conceded three times. 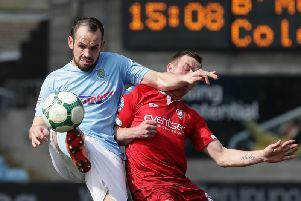 Substitute Darren Boyce’s second half goal prompted a mini-flurry of Ballymena pressure but this time there was no spectacular comeback like in previous rounds as the Ports progressed to meet Glentoran in the May 2 final. Manager Glenn Ferguson’s preparations were dealt a blow with the loss of goalkeeper Tim Allen. The Australian, who has produced a string of impressive performances since arriving in January, was ruled out with a chest infection. He was replaced in goal by Dwayne Nelson. There was better news, however, for Ferguson as defender Johnny Taylor won his fitness battle to line-up in the centre of defence, while the manager also welcomed back Gary Thompson, David Cushley and Gary McCutcheon into his starting line-up. Portadown bossed the opening exchanges and should have been in front as early as the third minute. Sean Mackle’s cross from the right was headed down by Gary Twigg into the path of Mark McAllister who blazed over when well placed. The striker wasn’t so wasteful, however, as Portadown took the lead a minute later. United defender Paddy McNally, deep inside his own penalty area, tried to clear his lines but his attempted clearance cannoned off the chest of McAllister and dropped at the striker’s feet. He took a step forward and composed himself before firing past the hopelessly exposed Dwayne Nelson. The Ports continued to boss the early exchanges and Nelson had to get down sharply to keep out Mackle’s cross-shot at the near post. Tony Kane dragged United’s first meaningful effort wide of the mark on 11 minutes before United suffered another hammer blow with a quarter of an hour played. Mackle played in Gault in acres of space down the right hand channel. The midfielder cut inside onto his left foot and his shot beat Nelson, only to be cleared off the line by Jim Ervin, but the ball dropped straight to Gault who didn’t even have to break stride as he drilled home the loose ball. Ballymena attempted to find a way back into the game and might have reduced the deficit on 20 minutes when David Cushley’s miscued shot was headed back across goal by McCutcheon and although the in-rushing Jenkins managed to make contact, he couldn’t get enough on his header to divert the ball past Miskelly. United’s already mountainous task took on virtually impossible proportions on 27 minutes. Gary Twigg’s cross from the left didn’t appear to have any imminent danger until Peter McMahon raced onto the loose ball past a totally pedestrian Ballymena defence and ran on to lob neatly over Nelson. Ballymena’s efforts continued to be sporadic, with Johnny Taylor’s free header from a Kane free kick sailing wide. The visitors might have gone in four goals in front at the break after Gary Twigg’s effort from Ross Redman’s cross from the left was straight down Nelson’s throat. The half-time whistle was greeted with a chorus of boos and catcalls from United’s support, with Ferguson bearing the brunt and the manager’s reaction was to replace Gary McCutcheon with Darren Boyce at the interval. Boyce’s first contribution was to produce a teasing cross from the left which Miskelly punched clear with a full-length dive and the keeper was able to recover to save Gary Thompson’s tame follow-up effort. United were almost given an extraordinary way back into the game on 57 minutes. Tony Kane’s cross from the left was met with a full-blooded volley by the back-tracking McMahon, who was facing his own goal, with the ball crashing off the post with Miskelly beaten to the world. United’s spell of pressure eventually earned them a reward on 70 minutes. Boyce latched onto Johnny Taylor’s long ball forward and his low shot deflected off Redman’s foot to wrong-foot Miskelly and give the Sky Blues a glimmer of hope. That goal appeared to finally light Ballymena’s touchpaper with firstly Cushley fizzing an effort off the outside of the post and then Boyce having a rising drive brilliantly tipped over by Miskelly. But on this occasion there was to be no Solitude or Tillysburn-style comeback as United’s run came to an end, with late penalty appeals waved away after keeper Miskelly appeared to bring down Cushley on the dead ball line. Ballymena United: Nelson, Ervin, McNally (sub Teggart 59), Taylor, McBride, Kane, Thompson, Jenkins, McCutcheon (sub Boyce 46), Tipton, Cushley. Subs (not used): Surgenor, Addis, McCaul. Portadown: Miskelly, Ramsey, Redman, O’Hara, Breen, Mackle, Gault, Mouncey, McMahon, McAllister, Twigg (sub Murray 73). Subs (not used): Brennan, Conaty, Little, Stewart.